This Tuesday a public discussion took place in the Heilig Kreuz Kirche in Berlin with several NGOs and faith-based groups from the USA and Europe, that subscribed to a joint declaration in 2016 as an answer to the global escalation of displaced people. We met two representatives from the USA, Amy Dalton and Susan Smith. Since the Eighties, churches and other organizations in the US have organized to support migrants. The “Sanctuary Movement” started when a Presbyterian church started responding to the immediate needs of refugees crossing the Arizona-Mexico border. First of all they must be helped not to die from dehydration. Then they are accompanied during their asylum application process. Activists of the Fellowship of Reconciliation and for sanctuary from Europe and USA agreed that they face very similar situations: similar numbers of victims and similar political challenges. Since Trump the situation in the United States has become much more drastic, says Amy. They realized that they had to address the public. There are many reasons why people flee, Susan says. Militarisation – the oversize military budget of the USA and Europe, and the export of weapons to crisis regions – and the neocolonial mechanisms of the developed countries of the North are, in their eyes, the most obvious. These joint organisations hope now to find more supporters for their declaration and to mobilise many people. “What does it take to create a world of peace?” asks Amy. “Our ethnic evolution is still stuck in tribalism. We should start to experience ourselves as a global race.” “Also our faiths need to be decolonized”, adds Susan. 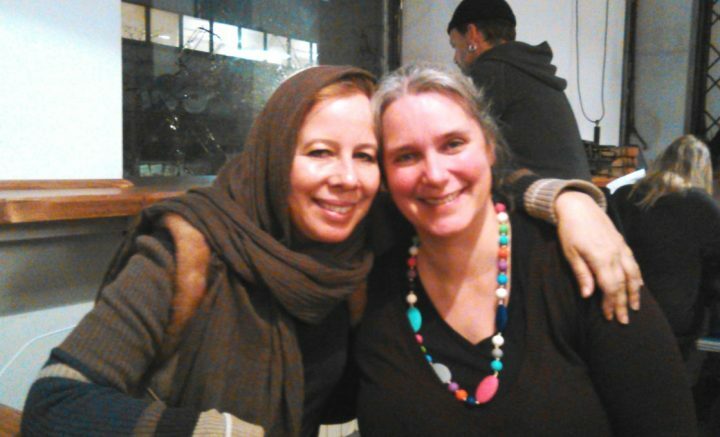 Both women are a part of the Community of Living Traditions at Stony Point Center in New York, an intentional multifaith community where Christian, Muslim, and Jewish families live and work together. It was a challenge but also extremely rewarding to leave your own religious comfort zone and try to connect to the same common values, Amy tells us. In principle you can find these in the Golden Rule, says Susan. The version: “Treat others as they would like to be treated” is the one she likes most.